Extra Load-carrying Capacity with a specially reinforced Stable bead technology. A Lifetime of All-Weather Traction with interlocking 3D sipes. Noise-Reducing Tread Design for serene and comfortable travel. Embedded with TPMS Active Sensor technology. Long haul, over the highway steering and all-position use, for coach and large RV use. Find a Dealer Near You to purchase this tire! * - ECE Certified # - Exceeding the lawful speed limit is neither recommended nor endorsed. Specially reinforced Stable Bead technology contributes to Maximum Load-Carrying Capacity. The 3D structure maintains tread stiffness for better wet grip performance over the full lifetime of the tire. The wet-optimized tread compound delivers excellent All-Weather Traction. For serene and comfortable travel the tread’s 3D sipes are staggered to reduce noise intensity and to shift the noise frequency for quieter running and enhanced ride comfort. Due to a specialized tread compound which is optimized for wet grip without compromising fuel efficiency. The Fuel Saving Edge in the tread design relocates material from a high heat build-up area to the ribs without compromising wet performance by leaving the total contact patch size unchanged. Eliminates manual tire checks and allows our tires to readily pair with any of our Digital Tire Monitoring Solutions to maintain proper air pressure and increase overall tire performance: increased fuel efficiency, noise reduction, proper traction and max load capacity. 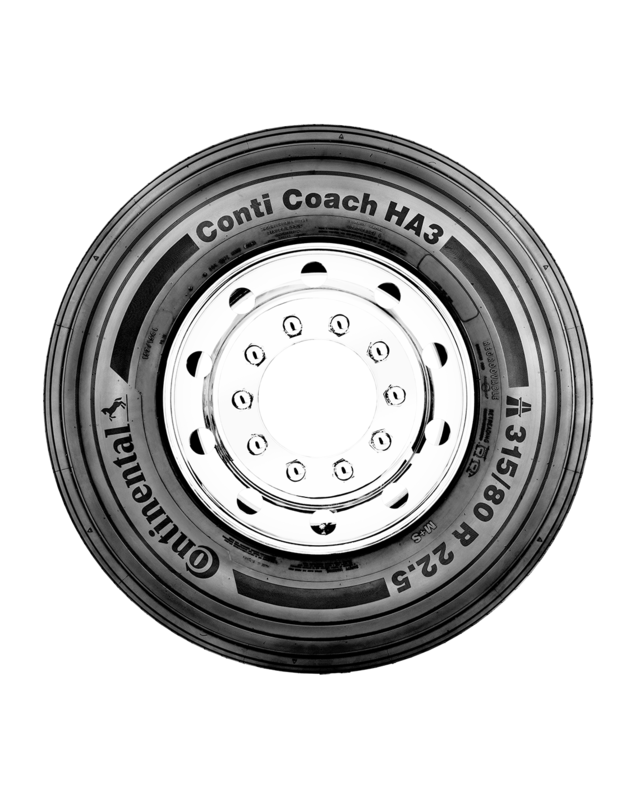 Look for the Active Sensor mark located on the tire side wall to identify the new Conti Coach HA3 with Embedded TPMS Sensors.